WB No. 192: STAVANGER, a rescue boat is one of the last of her type in existence, and probably the most original. STAVANGER is one of the last Colin Archer rescue boats in existence, and probably the most original. See WoodenBoat No. 209, November 2009 for the full story. In Tom Jackson’s Currents column in WoodenBoat No. 246, Nic Compton reports on the uncertainty of STAVANGER’s future. See also Currents in WoodenBoat No. 249 for a surprising resolution to her future. 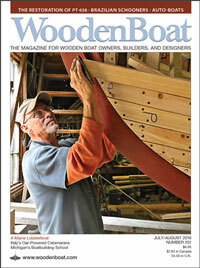 Back issues of WoodenBoat are available at the WoodenBoat Store.